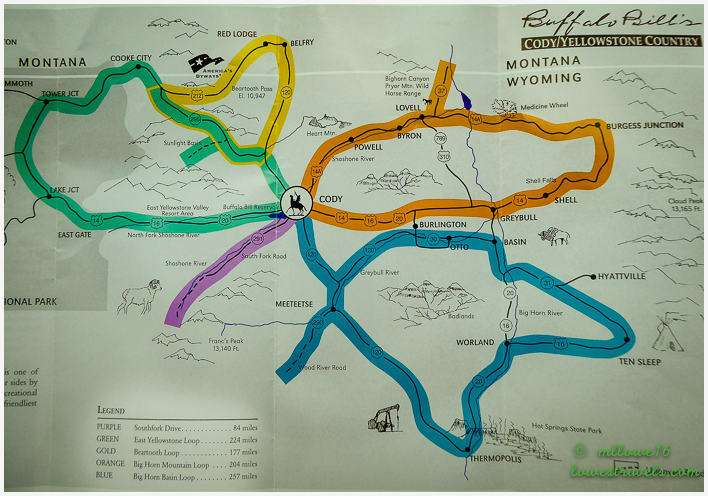 Cody is in the heart of the “American West”, a gateway to spectacular driving loops that allowed us to see the best of Wyoming. We drove them until Steve threw up his arms and said ” enough driving already!” Armed with a color-coded map, we set up our driving strategy and took off! 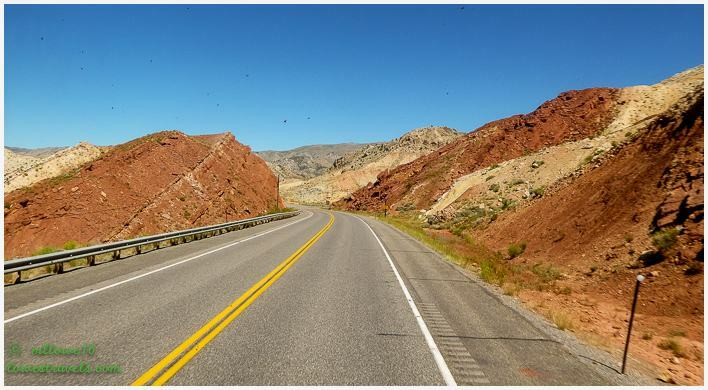 Coming here to our home base in Cody from the south, Betsy followed the western section of the Wind River Canyon Scenic Byway, a 34-mile route along U.S. Hwy 20 between Shoshoni and Thermopolis. Then we continued northwest on Hwy 120 through miles of broken range and badlands. 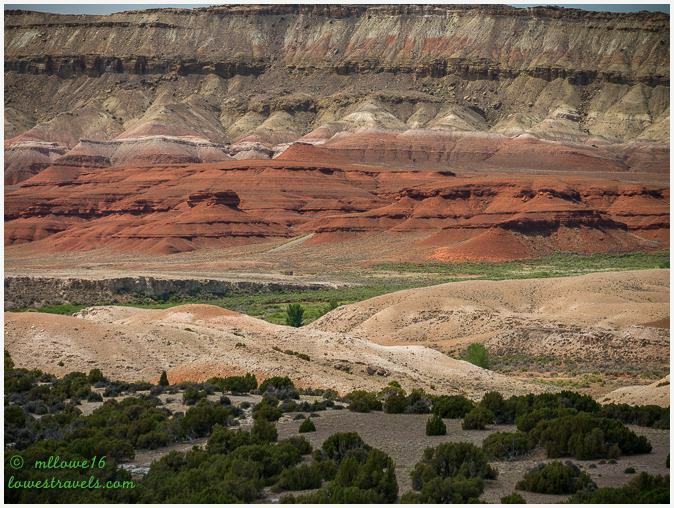 It was a beautiful trek through some of Wyoming’s most amazing geology. 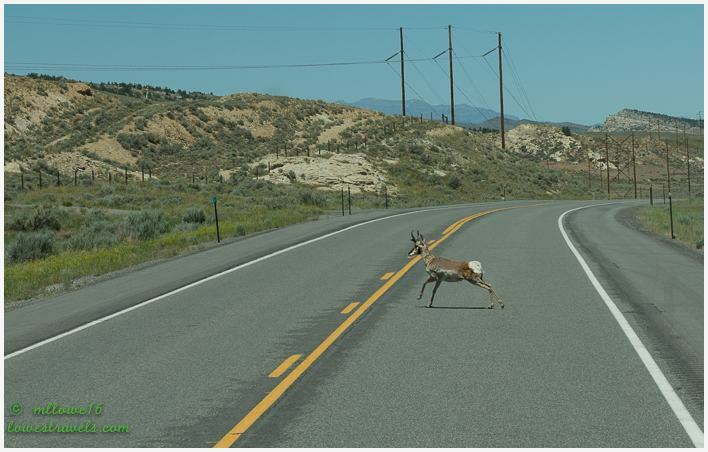 This Pronghorn hesitated next to the road, then decided to go for it. Hit the brakes! 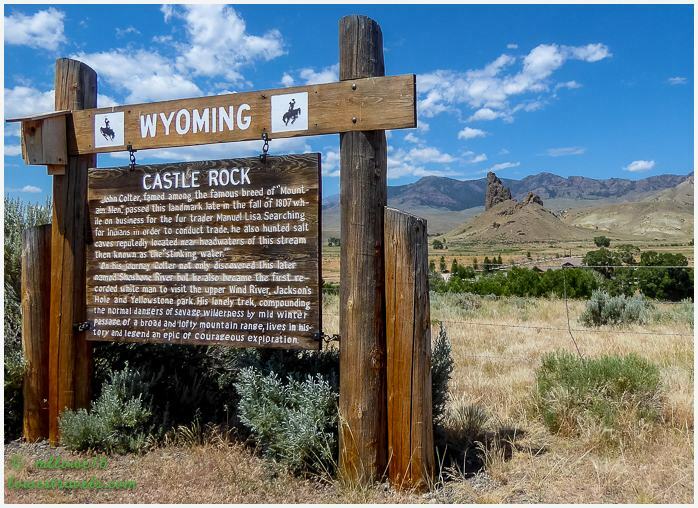 WYO 291 is also known as South Fork Road, and it begins off of Yellowstone Highway on the western end of Cody. 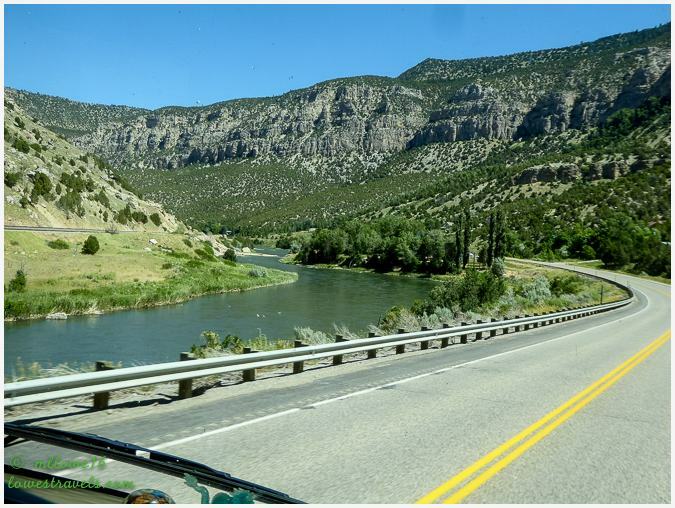 It parallels the South Fork of the Shoshone River upstream through a scenic valley. 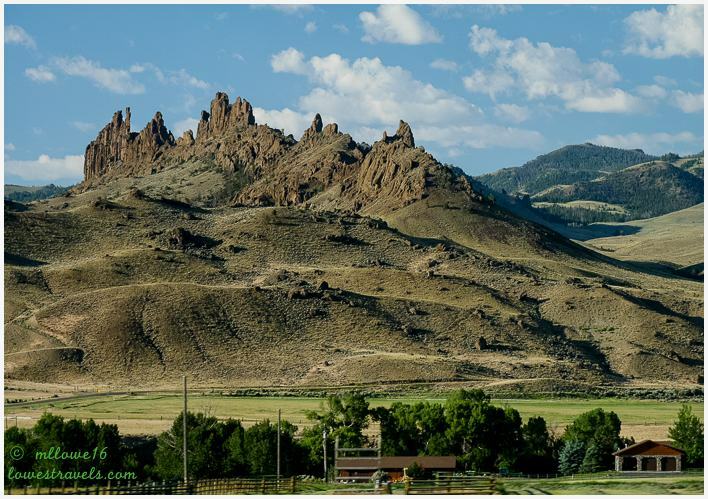 Along the way are prominent volcanic rock formations like Castle Rock, and a succession of picturesque ranches. The road eventually dead-ends on the fringes of the Absaroka Range. Castle Rock serves as a visual divider between the lower South Fork Valley and the more remote upper South Fork Valley. Around it are historic ranches and many exclusive private recreation properties. 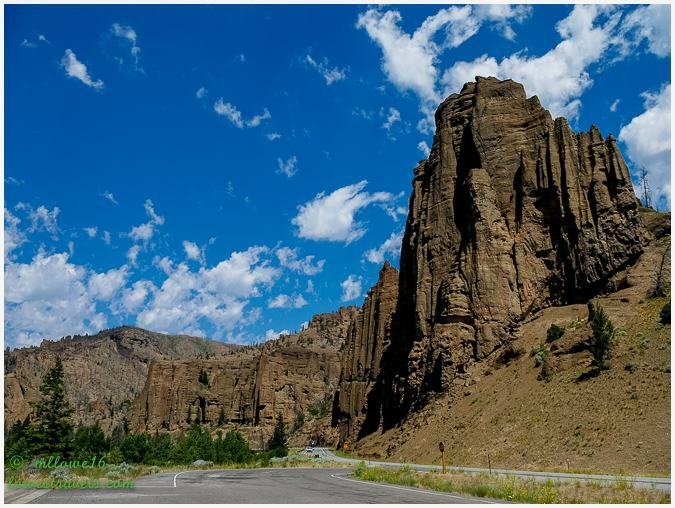 This stretch of U.S. Hwy 14-16-20 – also known as the Buffalo Bill Cody Scenic Byway – follows the north fork of the Shoshone River all the way to the east gate of Yellowstone National Park. 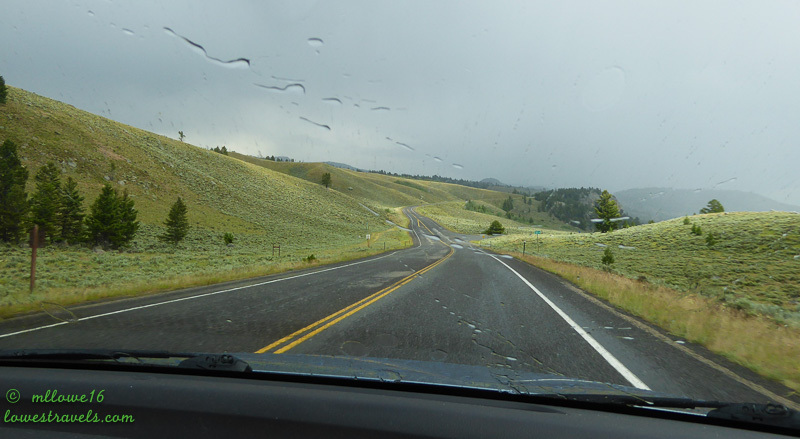 For this scenic drive our destination was the eastern side of Yellowstone NP. 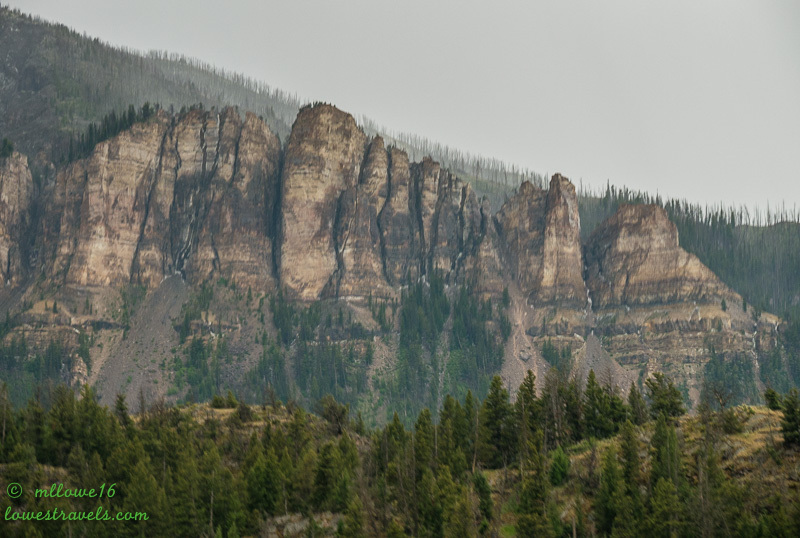 Along the way in Wapiti Valley, we craned our necks at the high rugged rock formations. The valley is known for its wildlife, and although there were notices posted about grizzly bears we didn’t see any that day. 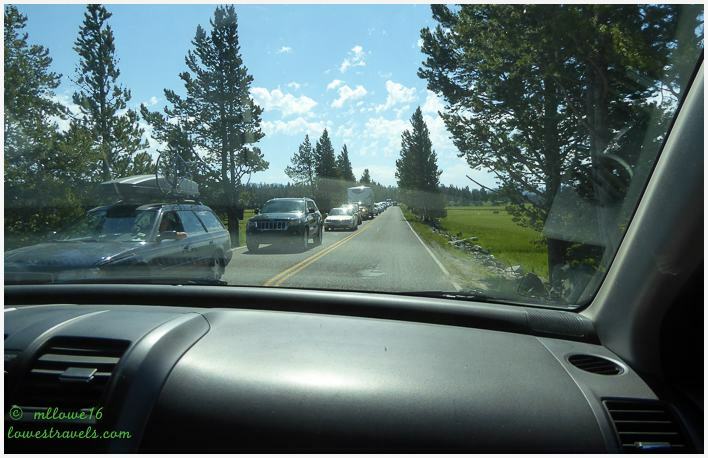 The byway entered Yellowstone NP at the head of the valley. It’s been ten years since our last visit here, so we thought it would be fun to revisit the oldest national park in the world. As to be expected, wildlife here is abundant and fortunately most critters shy away from people. 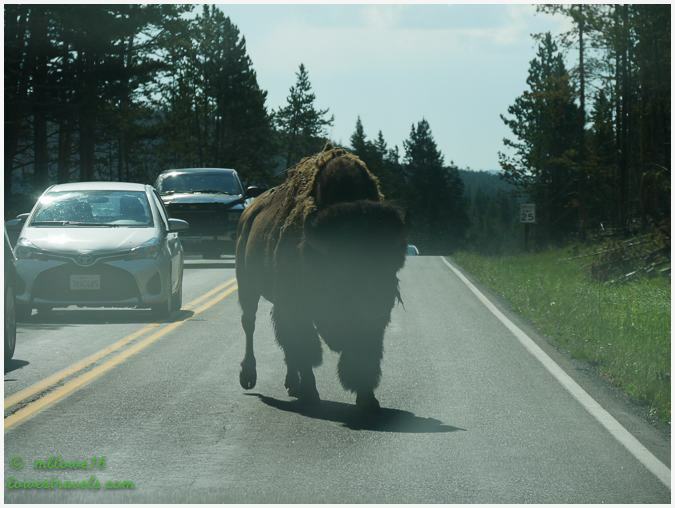 Visitors to Yellowstone NP can usually count on a traffic jam caused by the iconic Bison that live here. They aren’t shy! Unlike our first visit here, it was crowded with heavy traffic by 10AM this time. 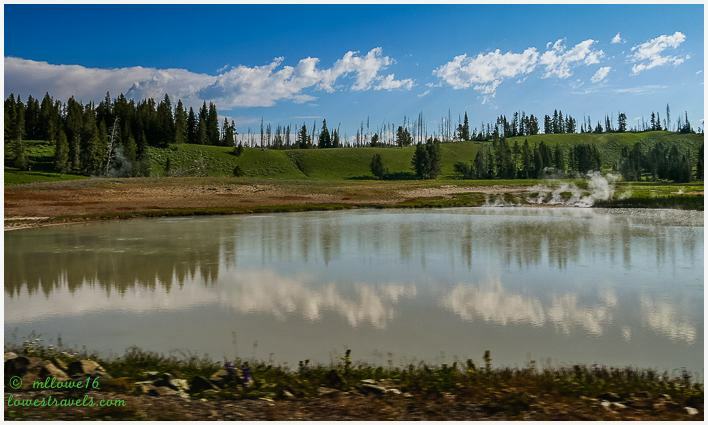 We turned around after a stop at Hayden Valley in the park, which gave us a 190-mile roundtrip for the day. 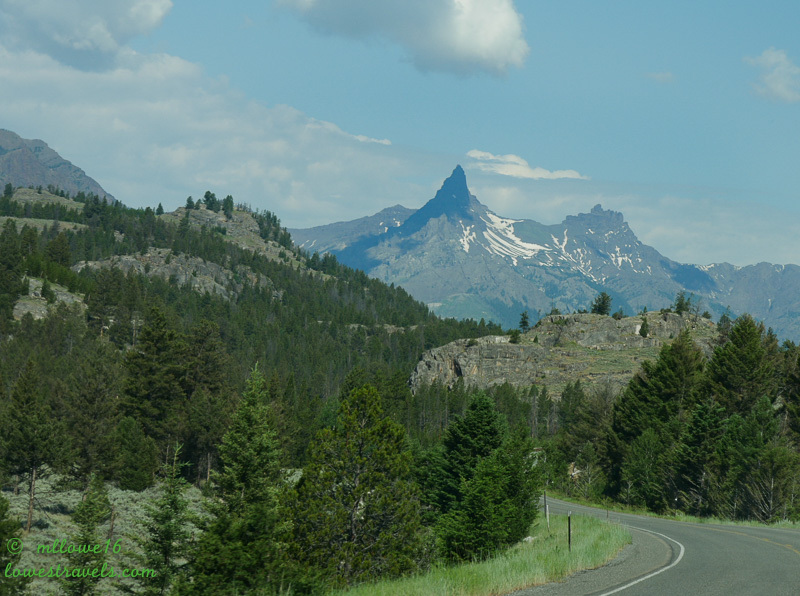 This drive with breathtaking views as it snaked through Wapiti Valley and over Sylvan Pass into Yellowstone NP made the traffic in the park worth tolerating. 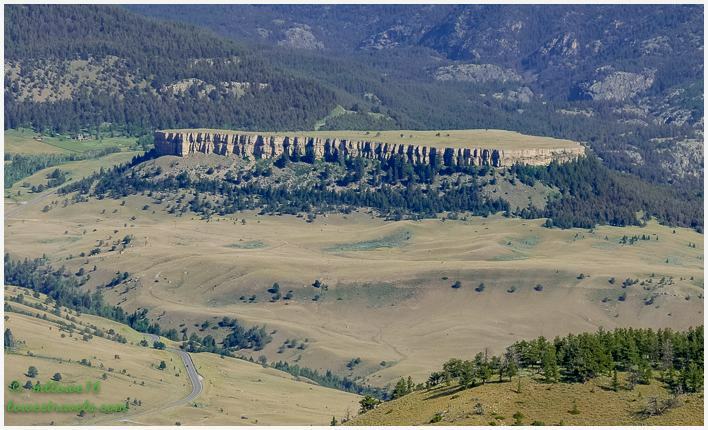 Chief Joseph Scenic Byway forks off of WYO 120 about 20 miles north of Cody. It follows the route taken by Chief Joseph as he led the Nez Perce Indians out of Yellowstone National Park and into Montana in 1877 during their attempt to flee the U.S. Cavalry and escape into Canada. 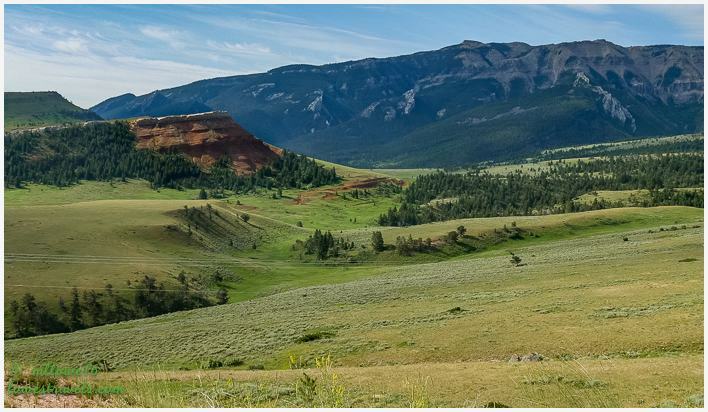 The scenic highway climbs though fields of wildflowers and past Chugwater formations on its way into Shoshone National Forest. 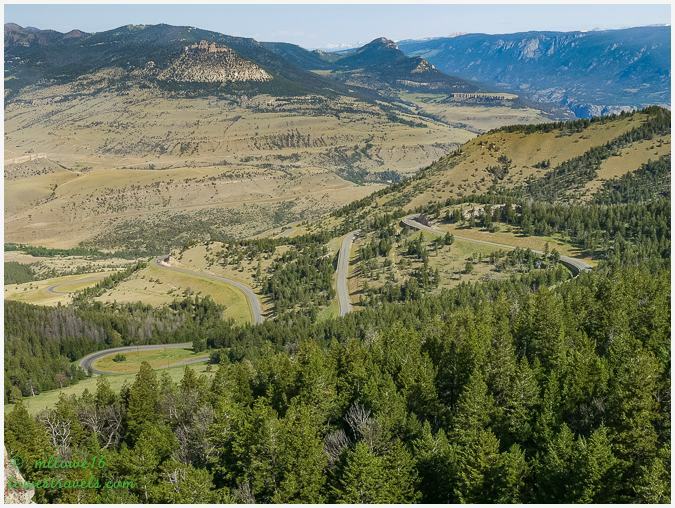 We pulled over at Dead Indian Pass (elevation 8,060′) to enjoy a dramatic panorama west into Sunlight Basin and north into Clarks Fork Canyon (unfortunately, due to a developing thunderstorm I caught only a glimpse of the 1,200′ gorge carved at Clarks Fork on the Yellowstone River). The scenic highway ends at the bottom of the Beartooth Highway (U.S. 212), and we drove west up to Cooke City and east to the Wyoming-Montana border. 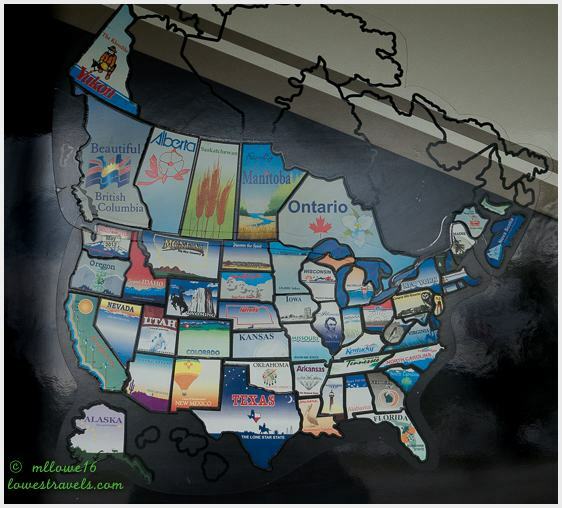 I’ll do another post on that section, as we drove it from our next home base in Montana. 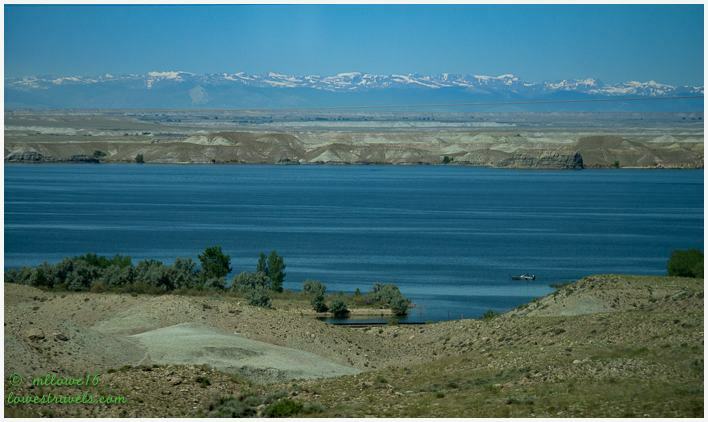 Taking U.S. 14A northeast toward Bighorn Canyon, we passed through irrigated farmland – a product of Buffalo Bill’s irrigation project – to the town of Powell. 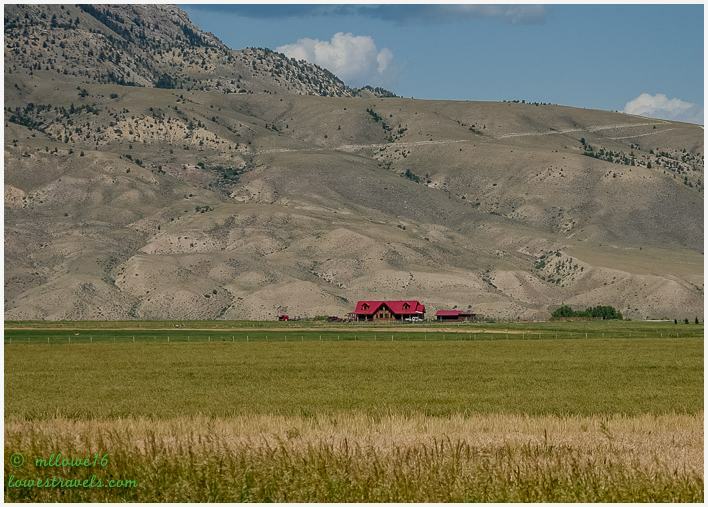 It’s the agricultural hub of northwestern Wyoming. 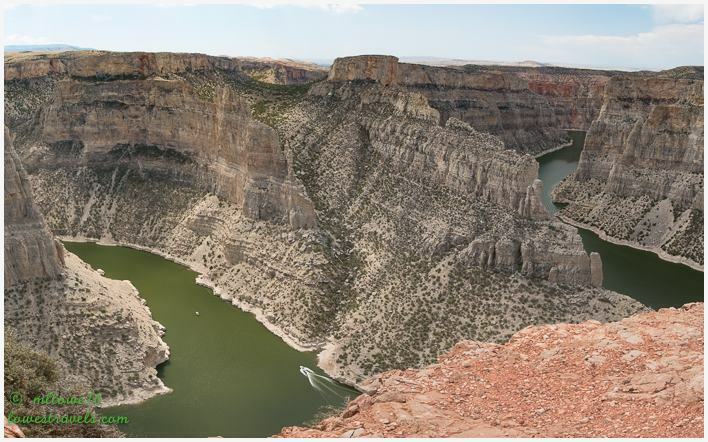 This overlook provides amazing views of the confluence of the Bighorn and Devils Canyons. 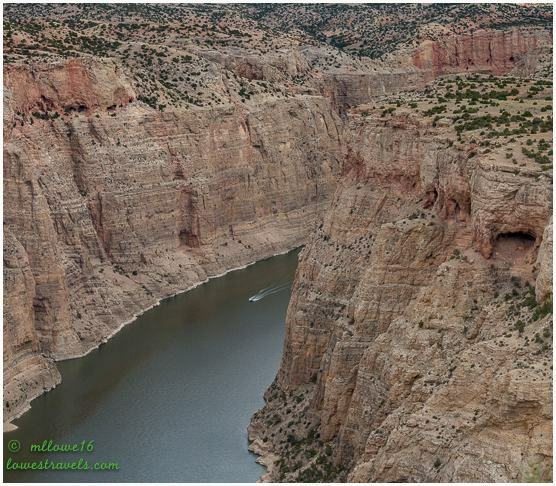 The narrow, winding, colorful canyon cliffs tower 1,000′ above lake level. On our way back home we stopped at the National Historic Site of the Heart Mountain World War II Japanese-American Relocation Center. This was one of 10 relocation camps set up around the country to detain Japanese-Americans in the wake of the Japanese attack on Pearl Harbor. 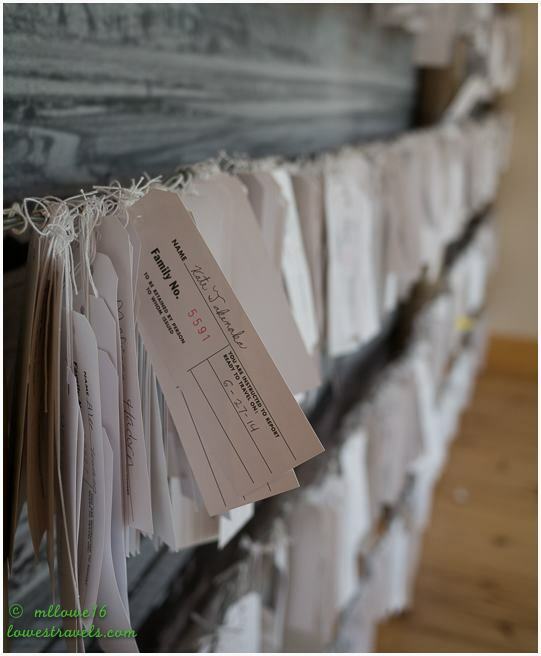 We had visited the Manzanar Relocation Center at Lone Pine, California in 2012, and found the exhibits to be interesting and sad at the same time. 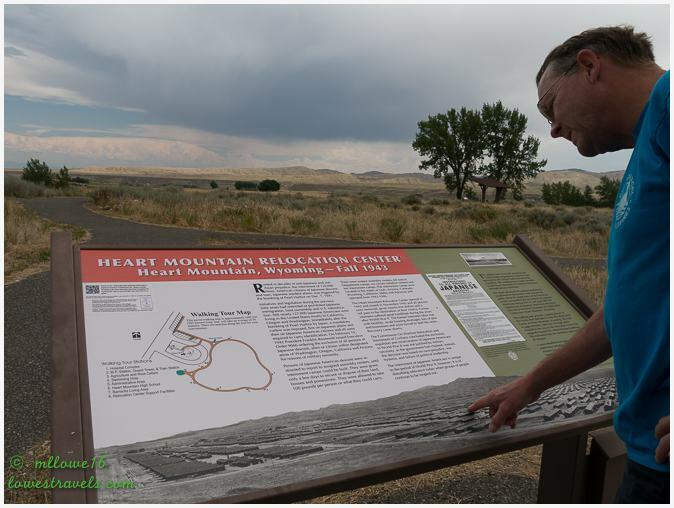 This site near Cody memorializes the experience of more than 14,000 Americans of Japanese descent who were brought into and out of the camp between 1942-1945. 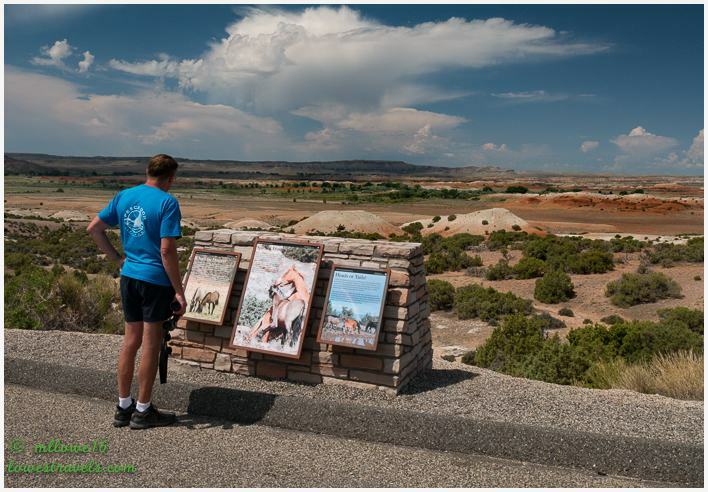 In a previous drive we were disappointed that we didn’t see wild horses at Pilot Butte Wild Horse Scenic Loop in Rock Springs, Wyoming. 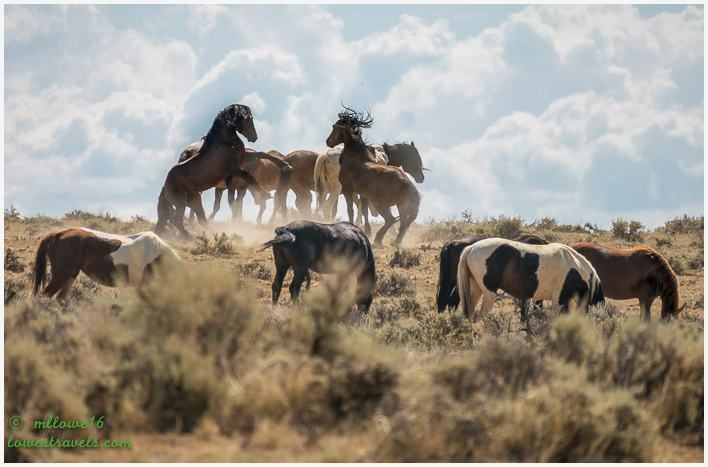 Here, I opted to join a private Wild Horse Tour, and for $33 I got a 2.5-hour viewing of the wild horses at McCullough Peaks Wild Horse Herd Management Area. The viewing area is 22 miles east of Cody on Hwy 14-16-20 at mile marker 72. 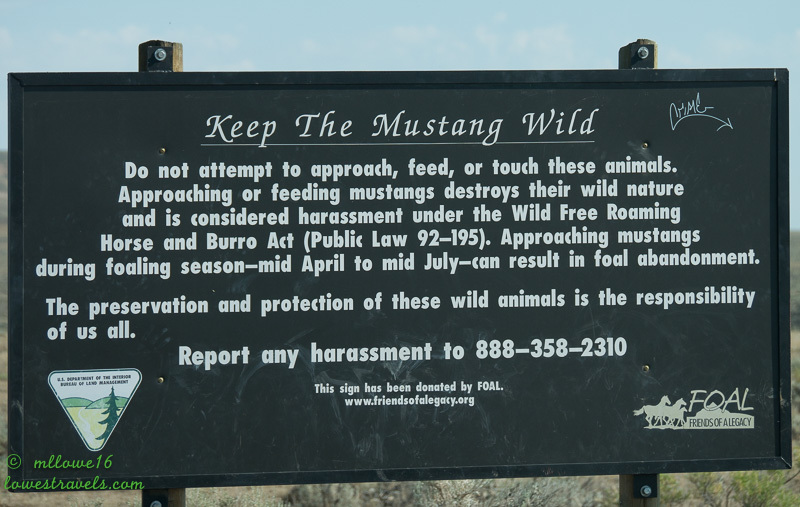 According to the guide, the objective of the Horse Management Area is to maintain a population of 100 wild horses. When over-population occurs, horses are removed and offered to the general public for adoption. 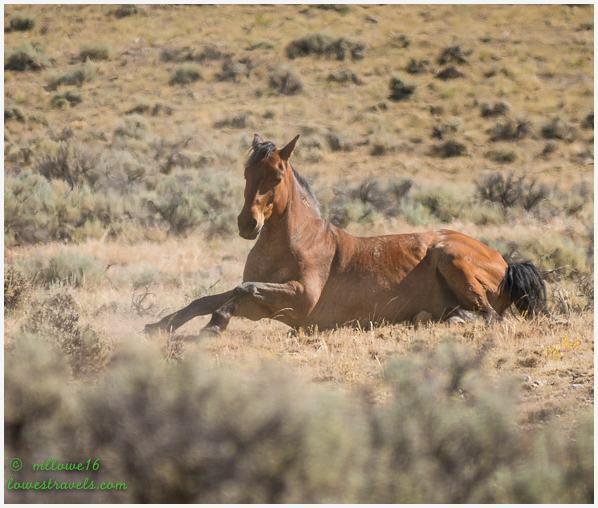 A wild horse as defined by federal law is unbranded, unclaimed and free-roaming on public lands. 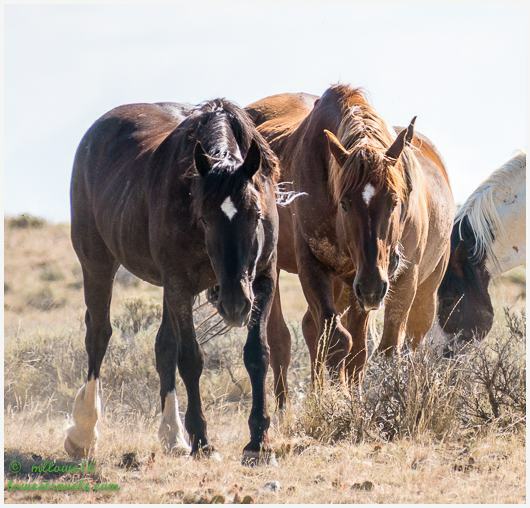 Wild horses and burros are descendants of animals that were released by or escaped from Spanish explorers, ranchers, miners, the U.S. Cavalry and American Indians. 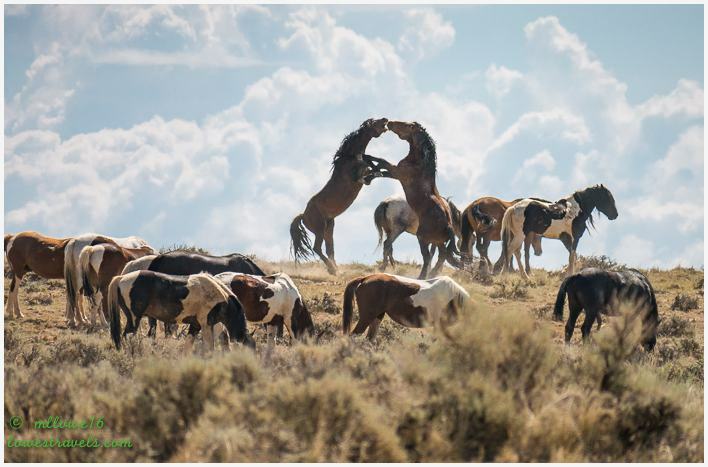 Stallions fighting to decide who leads the bachelor band – this was a rare capture! 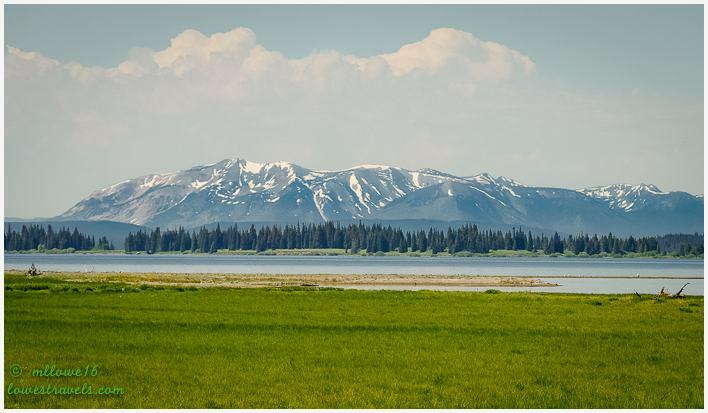 Northwestern Wyoming is wild and scenic, and Cody is in the center of it all. 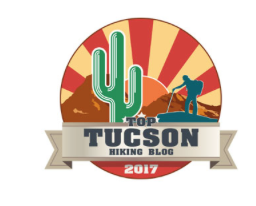 Every road we took rewarded us with rugged canyons, spectacular mountains, lush ranch valleys and vibrant wildflowers adorning hillsides. We’ll definitely be coming back to Wyoming – wild horses couldn’t keep us away!